Justin Bieber is a Canadian singer and songwriter. In 2008, the talent manager, Scooter Braun discovered him through YouTube videos covering songs and he also became the first artist to have 7 songs debut record chart on the Billboard Hot 100. Neymar, a Brazilian professional football player, one of the best players in the world. He plays as a forward in his team, Paris Saint-Germain and also the Brazil national team. Taylor Swift is an American singer and songwriter. She is the youngest artist signed by the Sony Entertainment when she was 14. She is one of the best selling music artists, sold more than 40 million albums and single download. An American singer,actress,song writer,dancer and producer. She performed in various singing and dancing competitions since child. Forbes also ranked her as the most influential and powerful female artist in entertainment. Jennar is an American television personality, model,entrepreneur and social media personality. She is born in 1997, age 22 this year. She is the founder of Kylie Cosmetics. She and her sister, Kendall also collaborated with the clothing brand PacSun, and created 'Kendall & Kylie' clothing brand. Kardashian is also an American reality television personality, socialite and entrepreneur. In recent year, she has released her products tied to her name, including clothing and mobile game. She married in 2014 and have 3 childrens. Johnson, The Rock, is a semi-retired professional wrestler, actor and also producer. He won 8 times in WWF/WWE Champion and won the 2000 Royal Rumble. His first leading film role - The Scorpion King (2002), was also debut the world record of paid in actor first starring role. Ariana Grande, an American singer, songwriter and actress. She began her career in Broadway musical 13 and start her music career in 2011. She has wide vocal range and her latest album 'Thank U, Next' is her fifth studio album. Selena Gomez, an American singer, producer and actress. She gained wider recognition through the portrayal of television series Wizards of Waverly Place on Disney Channel. According to Billboard, Gomez has sold over 7 million albums worldwide. Ronaldo, a portuguese professional football player who plays as a forward and captain for Juventus and Portugal national team. He is the first player who won 4 European Golden Shoes and 27 trophies in his football career. Ronaldo is also known as the world's most famous athlete in 2016 to 2018. 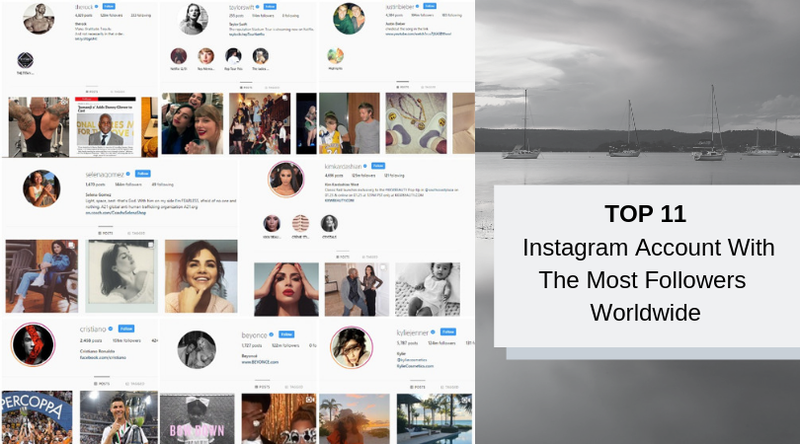 Instagram (IG), a photo and video sharing social app, owned by Facebook Inc. Instagram grew rapidly and gained popularity after its launch in 2010, with around 1 million users registered in just 2 months time.